Delighted to be able to make our presentation (along with Sue Smits of Morrells Handwriting, Worcester) at the Department of Education on Wednesday 12th February, with Robin Walker MP for Worcester in attendance. It was positively received and we look forward to some progress in the near future! Apologies for the delay in replying to your letter of 31 January 2018. The Chair has asked me to respond on his behalf. Thank you for bringing your concerns about the support available to left-handed children to our attention. The Committee currently has no plans to inquire into this area. Disappointing but not entirely unexpected! At least it has raised some awareness within the Committee. The DFE has NO figures on how many children are Left-handed. In the National Curriculum, there is a section on Handwriting which is statutory, where for left-handed children it is NON-statutory. Equal opportunity? I would argue that left-handers need more help with their handwriting than right-handers. The left-handed child needs to be shown a different writing technique to the right-handed child otherwise they will smudge their writing, have difficulty seeing where one word ends and the next should begin as well as having problems copying work. Nick Gibb MP (Minister for School Standards) recommended we have input into the new Initial Teacher Training Curriculum last year, which we did. However, when published there was NO mention of left-handed children. We are awaiting a response from the Committee Chair, Robert Halfon MP. 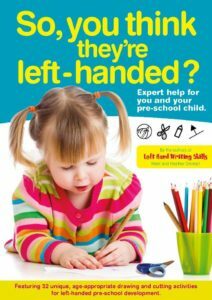 We wish this book had been available when we found out our son was left-handed! You may have noticed that your preschool child does things with one hand in preference to the other or maybe they swap from one to the other. But how can you be sure which will eventually be their dominant hand for writing? And can a child be left-handed, but right-footed and perhaps left-eyed? This book helps parents and carers to spot the early signs of side-dominance. It also provides 32 enjoyable structured activities for preschool children, who you think may prefer to use the left rather than the right hand, as they learn to use pencils, pens and scissors. Each sheet contains reminders for page position and hand grip, and leads pre-school children through a range of different exercises designed as preparation for their school life. Due to the General Election. All e-petitions were cancelled, including this one. “Ban the testing of joined up handwriting in primary school SAT’s. Year 2 children need to be ‘using the diagonal and horizontal strokes needed to join letters in most of their writing’ to achieve the Greater Depth Standard in the SAT’s tests. As handwriting experts, Morrells Handwriting disagrees with this handwriting statement in the Interim Teacher Assessment Framework, which contradicts the handwriting statements in the current National Curriculum. Testing joined up handwriting puts schools under pressure to cut corners and rush children into joining up their handwriting before they are ready, causing an epidemic of illegible handwriting in our secondary schools. There is no long term benefit of rushing a child to join up their handwriting; it is simply to tick the boxes of the handwriting statements. We believe that children should not be tested on joined up handwriting, but taught on ability with the focus on legibility. Likewise, it should be a statutory requirement that left handed pupils receive specific teaching to meet their needs, to help them master legible handwriting and continue to love writing”. 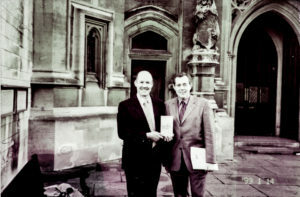 20 years ago, Peter Luff MP tabled 2 Parliamentary questions on whether there were any figures on how many children in Education were left-handed; and whether being left-handed had any impact on likely educational achievement. Publication of a framework of core content for Initial Teacher Training. Despite our meeting with Nick Gibb, Minister for School Reform, and Sir Peter Luff, there is no mention whatsoever of “Left-handed Children”! 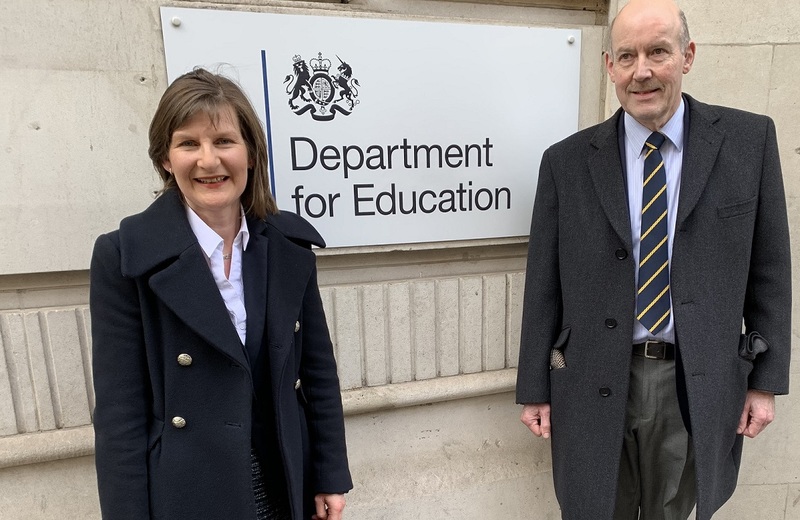 We had a very positive meeting with Nick Gibb MP, Minister for School Reform, and Sir Peter Luff MP, who recommended including a specific section on left-handed children in the core parts of Initial Teacher Training. We look forward to its inclusion which would provide immeasurable benefits for current and future generations of teachers and children! Wise Owl Toys/Left n Write of Worcester scores 100% in secret shopper visit. WiseOwl Toys, the educational toy shop based in Worcester, which also has a specialist ”Left-handed” section (Left n Write), has just received a perfect 100% score when it was visited a by an independent secret shopper sent by STABILO, one of Europe’s leading pen manufacturers. STABILO manufactures a range of writing instruments especially developed to help children learn to write with products for both left and right handers. Learning how to write is still a key skill even in the digital world and remains a core part of the curriculum. ”Everything about the shop was excellent, extremely clean and tidy, very well presented without being massively high tech and off putting. A really nice traditional shop with innovative products and outstanding expertise from the owner/salesman. I didn’t feel there was any improvement needed. I almost wish I had a child with writing difficulties so that I could go back to the shop as it was such a nice experience with a real personal touch which is often lost with large stores”. Another battle has been won in Peter Luff’s long campaign for left-handed rights. That was the reaction of the Mid Worcestershire MP to the news that the Government’s new National Curriculum for primary and first schools will ensure left-handed pupils receive specific teaching to meet their needs. Peter had successfully challenged the last government to ensure that left-handed children were taught properly by incorporating their special needs in teacher training. 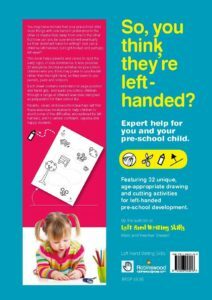 Last month Peter wrote to the Department of Education seeking reassurance that the often overlooked needs of left-handed pupils would be included in the Government’s new national curriculum. Article by Anjana Ahuja in The Times 2 of Tuesday 27th January about Barack Obama’s handwriting technique! “Room for improvement” is suggested! Launch of the New Stabilo “Easy ergo” pencil, which is the follow-on from the Stabilo ” ’Smove Easy” pens which have proved such a hit with both right and left-handers! Interview for BBC Radio Wm on some of the potential difficulties of being left-handed! National Handwriting Association Journal Autumn 2005. Publication of 3 NEW “Left Hand Writing Skills” books. All books have been specifically designed with young left-handed children in mind. Opening vertically so that the child doesn’t have the left hand caught in the usual spine of the book, there are icons on each page to show pencil grip and page angle as well as specific letter formation for the left-hander. Advice for Parents and Teachers is included as well as “Top Tips” on every page of Book 1. Helpful contacts and product information is also included. “Schools” version also available. This is an amalgamation of all three books, in mono, and fully photocopiable. Are now available on CD for purchase with E-Learning Credits. May 1st – 3rd, 2003. 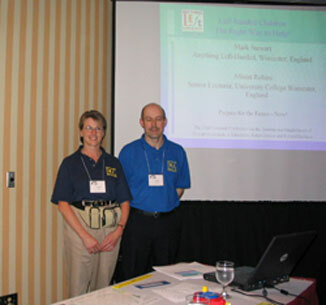 Presentation of workshop at the National Resource Center for Paraprofessionals Annual Conference in Los Angeles. Distribution of the video and wallchart to ALL providers of initial teacher training funded by the Teacher Training Agency. Parliamentary question by Peter Luff MP to the Minister for teacher training about the video. Sponsorship agreed with The Post Office, Berol and others to produce video and wallchart. Adjournment debate in the House of Commons. See the web site address below for full text. 2nd letter from DFEE admitting that “there are no current Government plans to make training for teachers in respect of left-handed children a compulsory part of initial teacher training”. SENCO guidelines finally published with NO mention of left-handedness. Letter from DFEE accepting that it would be desirable for teachers to be aware that being left-handed may cause difficulties for some pupils. Letter from Estelle Morris MP to Peter Luff MP accepting that being left-handed may cause difficulties for some pupils. Letter from David Blunkett’s (Secretary of State for Education) Private Secretary agreeing that left-handedness should not be defined as a special educational need. letter sent to Anthea Millett defining our final arguments as to why there should be a specific policy in the SENCO guidelines. Letter received from Estelle Morris MP, then Minister for teacher training, via Mike Foster MP for Worcester City stating that the SENCO guidelines were NOT going to mention individual special education needs. 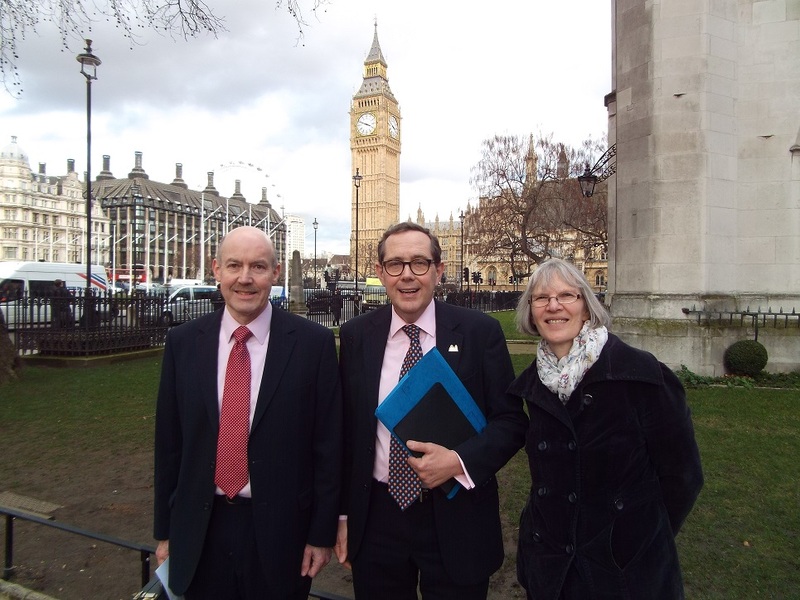 Meeting at the TTA (Peter Luff MP, Mark Stewart and Lauren Milsom). Suggestion by Anthea Millett Chief Executive, and still in post now, that there should be specific policy in the new SENCO guidelines even though she appreciated that being left-handed was not a special need. It never has been our view that being left-handed is a special need – rather it is a matter of equal opportunity! She said that she would personally support this inclusion. She also suggested making a training video to dovetail with the SENCO requirement. Written reply from the DFEE to Parliamentary question. “Teaching methods and arrangements for the induction and in-service training of teachers are not centrally prescribed. It is for schools and teachers to determine the most effective way to ensure they meet the needs of all their pupils, using the resources available to them. The Secretary of State specifies broad criteria for courses of initial teacher training, including the need for new teachers to be able to respond to these criteria. All schools and courses of initial teacher training are subject to independent inspection followed by published reports”. Written reply from the DFEE to Parliamentary question “The Department does not collect information on what proportion of pupils are left-handed, nor on whether being left-handed has an impact on likely educational achievement”. Also “The Teacher Training Agency accredits course providers to ensure that they meet the Secretary of State’s criteria. These criteria require new teachers to be able to identify and to respond appropriately to relevant individual differences between pupils. Despite being left-handed, I see no need for further information for providers in this respect”.